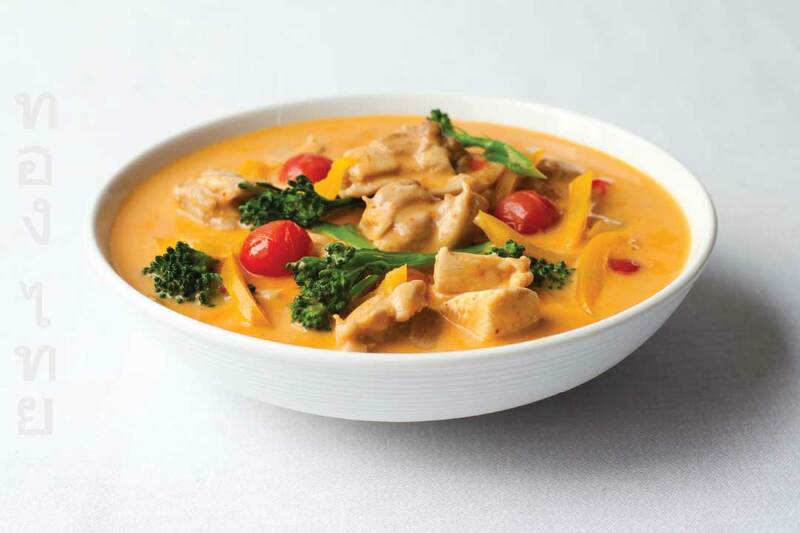 Thai Yellow, ‘Gaeng Karee’ is a mild southern curry with hints of turmeric and cumin from south asian trade routes. Add 2 tsp of Thai Gold Yellow Curry Paste and stir, combining the paste with the milk. Add the finely sliced chicken, chicken stock and cook for 5 minutes. Add 2 tsp of Thai Gold Nam Plaa (Fish Sauce), and 2 tsp of Palm Sugar. Cook at medium / high heat for 8-10 minutes. Add 2 tsp of Thai Gold Nam Plaa (Fish Sauce), 2 tsp of Light Soy Sauce and the Palm Sugar. Cook for 3 minutes. Next add the vegetables and cook for a further 4 minutes. Hot & Spicy: Add some fresh chopped chillies with the vegetables. Variation: Try any seasonal fresh vegetables.